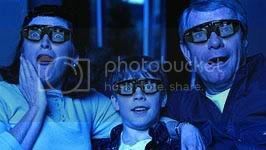 Enjoy 3D Digital, Special Effects at Home! This unit harnesses the power of 3D and brings it right into your own living room... faster than you can say WOW! After years of research, a group of scientists and engineers have finally achieved what many have considered to be the impossible: Convert a standard 2D video image into a true, holographic-like 3D projection - in real time. 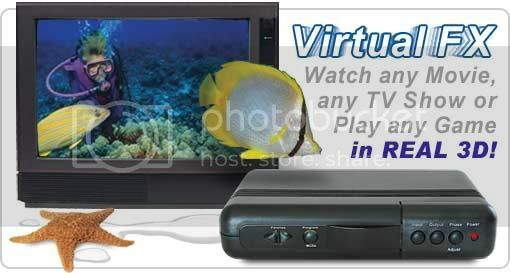 What this means is that you can now watch virtually all of your favorite TV shows and sporting events, your entire collection of VHS and DVD movies, your entire library of home videos and play every video game you have ever owned -and do it ALL in Real 3D! THATS RIGHT you get 30 Guaranteed DVDs which includes 5 GREAT IMAX DVDs and the very rare DVD The CREEPS! 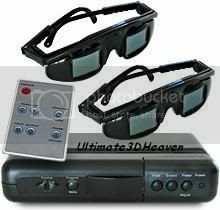 2D to 3D Converter and 6 total pair of wireless glasses!